All weekend long, The News warned us to brace ourselves for a significant drop in the Dow but even before I had a chance to get a second cup of coffee yesterday morning, the average was down by more than a thousand points. I vividly remember the pit in my stomach when the market finally opened after 9/11 and immediately plunged 600 points and again when it did so in September of 2008. Ironically as the 2008 troubles started, we were too busy around here holding down the fort in the wake of hurricane Ike and didn’t even notice that a crash had started for a few days. Well it certainly felt like a Monday morning. And yet today I’m entirely at ease despite the fact that my 401(k) is (was?) larger than it was back then and my losses today are therefore that much more substantial. I know that my plan is diversified and, even more importantly, I know that my management firm is busy buying stocks that are on sale today instead of selling off. A similar approach to business continuity yields the same results: kind of an alert placidness in the face of considerable adversity. How? One of this month’s other big stories is the 10-year anniversary of hurricane Katrina and despite a sleepy Atlantic tropical hurricane season so far this year, the season obviously isn’t over yet. As a lifelong Gulf-coaster I know that the conditions are still ripe for an extremely late-forming storm to mess up my entire weekend but with a solid, constantly updated, diversified business continuity plan . . . alert placidness. I don’t agree with all the reasons I’ve heard for why we shouldn’t freak out about the stock market but I also know that the market is a long game and that confident patience is rewarded. In fact, as I type this the index is back up 352 points above yesterday’s close. I particularly don’t plan to be this guy. I do already have an ample supply of food to survive on for a while, although maybe not for a whole month. As should we all. Just to reiterate, hurricane season is not over yet. (That’s a pretty good article. Go read it. But come back.) There’s still some steam left in the Atlantic and Gulf, never mind that we’re still weeks away from the average peak of the season. While we’re at it, here’s my favorite graphical compilation of all things current on hurricanes. The concept of personal continuity isn’t touched on very often but more than 100,000 people have lost their jobs recently due to the recent reversals in the oil industry and many are facing financial upheaval if not actual ruin. Experts recommend a three- to six-month personal emergency fund. I disagree. Make it a full year and younger professionals should make it a goal to achieve this “do not touch” fund within the first five to seven years of their career. Unorthodox, certainly. It’s not easy and it might mean putting off that first new car and a couple of vacations. But again, alert placidness. The other big continuity issue this summer has been the unrelenting, unpredictable and several times fatal wildfires in many of the western states. A large number of my friends and family members live in areas around California that are at risk each summer, many of whom have also lived in hurricane zones. Several have pointed out the similarity in the mindset that you have when it comes to living and working in areas that have different kinds of threats, although western states seem to have more than their share. The fires are a good reminder that every possible threat should be considered, regardless of relative unlikeliness, in a good business continuity plan. 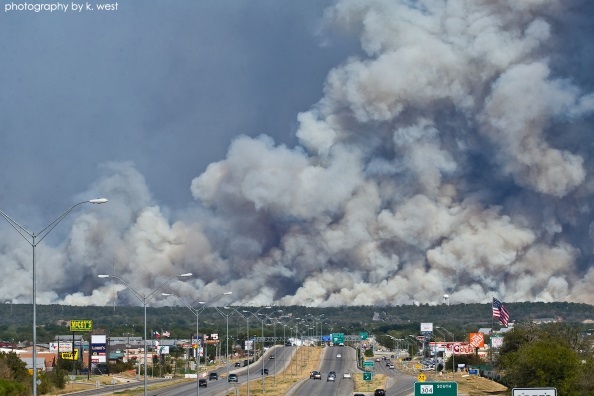 A lesson we learned all too well when the drought of 2011 resulted in huge fires in the Texas Hill Country – an area that “almost never” has to deal with that type of threat. And then there’s the creepiest of all natural disasters, sinkholes. Which are just wrong.